PIZZA HUT BACK @ THE AAC! 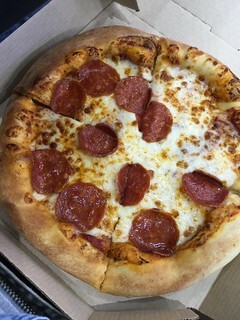 I am at the AAC the other night (American Airlines Center), and I was pleasantly surprised to see that PIZZA HUT was back!!! I have been disappointed by the offerings at the AAC concession area for the last few years… so I was like..oh wow…pizza hut. …BUT then I notice that they have a NEW pizza. It’s NOT the small personal pan pizzas anymore. It’s a NINE-inch-hand-tossed pie….and it’s NINE BUCKS… which is insane but I am happy to pay it because… hey…it’s a hockey game so why not…and the pie is actually pretty damn good! Seriously, look at that pie. It’s gorgeous. It was hot and fresh and very-very filling. Oh…yeah..and the Stars lost… but hey the pizza was a nice band-aid. I annoyed everyone around me at the game and on the drive home about how great the game was…..because of the pizza.